Chris Klimas talks a bit about Twine, his program for making hypertext games, and the early days of IF. What drew you to interactive fiction back in the ‘90s? What was the scene like back then? I was intrigued by playing IF while I was growing up in the 80s — mainly the Infocom games. I think what I liked most about it was the feeling that the world of an IF game was so vast. I was pretty awful at the puzzles, so my experience of playing was an overwhelming sense there was all this content just out of reach. In a way, the content of the games existed more in my imagination than actual code. But that, to me, isn’t necessarily a bad thing. Anyway, once I got access to the Internet a decade later, I somehow found my way to ftp.gmd.de — the predecessor ofifarchive.org — and from there I found Inform, and fell a little bit in love with it. I liked the idea of building the vast world people chipped away at puzzles to reach. Of course, I learned that there were a whole other set of challenges once you’re on the other side. By the time I started tinkering with IF, the community had at least established itself, though it grew a lot while I participated in it. Even so, it was not tremendously big, but there was a sense of progress to it, and room for enormous experimentation. The day before the IF Comp felt like Christmas Eve. There was also an air of mystery to it, same as with any online interaction back then. You didn’t really know exactly who it was behind the newsgroups posts or the ifMUD accounts. It was a smidge surreal, meeting many of these folks many years later at the IF suite at PAX East 2010, and discovering they really were living breathing human beings and not eldritch presences on the net. Were there a lot of interactive fiction stories around back then on the internet? Was it seen as a medium relating to games as much as it is today? I would say there were enough that you could reasonably have at least tried all of them, if not played through completely. And that made for fruitful discussions online — you could refer to, say, So Far or Delusions and expect that everyone in the community would know what you were talking about. The IF community online has often, to my thinking, defined itself in opposition to mainstream video games. Back then, the rallying cry was the power of words compared to the flash of graphics– which echoed much of Infocom’s marketing. But I don’t think there was any question whether IF was a game medium, per se. Were you inspired by literature as well as games? What’re some of your favorites of each? Of course! My favorite author ever is Ursula Le Guin. I love how convincingly she creates worlds, and the sense of humanity she brings to everything she writes. Close seconds are Italo Calvino — his novels are a rare combination of experimental and accessible — and Hunter Thompson, just for the way he could write a sentence. I think my favorite game is Ico, though Shadow of the Colossus is a close second. Ico’s world was just a pleasure to inhabit. It had just the right combination of beauty and mystery to me. I also like the early entries in the Silent Hill series a lot. I don’t care much for horror movies or stories, but it turns out I love horror in an interactive medium. And the early Silent Hills seemed to want to tell an interesting, offbeat story. 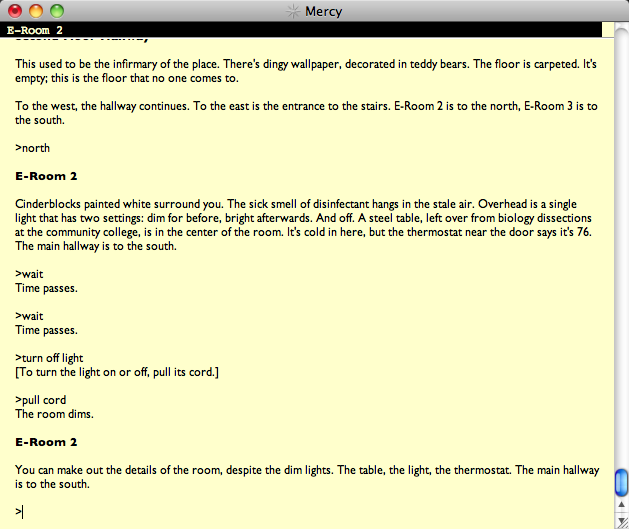 I read a review of Mercy on Spagmag, where it mentions that there are no “puzzles.” what made you go with this style of “game?” Mercy feels more like a Twine game than a text adventure like Zork. There was a puzzleless IF game called In the End that came out a year before Mercy, and I think I saw it and thought, “this is interesting, but I think I can do better.” If you look up In the End on IFDB, there’s a quotation from a review I wrote many years ago about it that seems rather nasty in retrospect. But I don’t think of the core sentiment as negative. There’s a leapfrog effect in creative communities, I think, where people feed off each other work. Anyway, I think my motivation at the time was to play with the idea of a puzzleless game — something that some people in the IF community at the time, including myself, held up as an ideal. The reviewer also says this: “Chris Klimas says that he hopes “Mercy” is something new in the interactive fiction universe.” I think this is spot on, especially after seeing how explosive Twine is. What do you think? I look back on Mercy sheepishly — I wrote it in high school, and to me it feels awkwardly moody in the way that high-school poetry can be. I don’t see it as an immensely groundbreaking work, except for myself. It was a big step foward in my development as a writer and game designer. Every first release is for the person who created it. I do think Mercy is a different sort of game from the typical IF game of the 80s, but nearly everybody in the community was grappling with that same question: what should modern IF be? What’s archaic and what should be considered classic? I feel that all of the IF after the commercial era has grappled with that question. We just approach it different ways, and come up with different answers. Do you think this approach to narrative influenced the creation of Twine? I hadn’t thought about it until you asked the question, but I can see the connection. 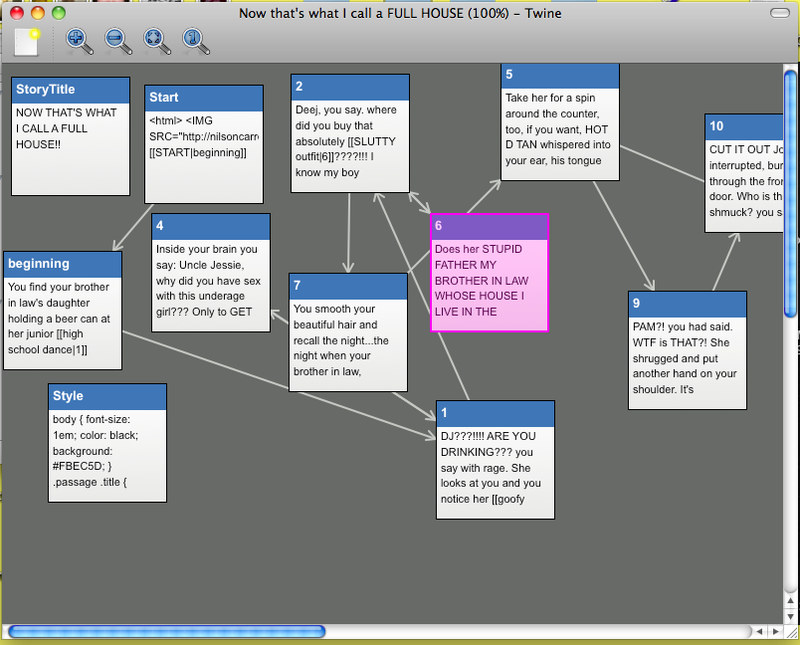 It’s easy to write narrative in Twine, harder to craft game mechanics in it. And that does mirror my own personal interests. Are you happy with the community’s output with Twine? Have you played the games by Porpentine and Kat Chastain? What are some of your favorites? Definitely! The fact that I have no idea exactly how many Twine games have been made makes me happy. The ‘hundreds’ number on the twinery.org homepage is a just a best guess. As for favorites, hmm– that’s a tough one. The two most recent Twine games that I’ve really enjoyed were Porpentine’s Ultra Business Tycoon III and Brendan Patrick Hennessey’s KING OF BEES IN FANTASY LAND.